Einige Wochen sind ins Land gegangen -viele Fragen bleiben! Wenn man erstmal mit den Gedanken bzw. der Planung für so eine Monsterreise anfängt, ahnt man ja gar nicht, wo das endet. Schlimmstenfalls im Wahnsinn! Some weeks have gone into the country - many questions remain! If you start with the thoughts or planning of such a monster journey, you do not even suspect where this ends. Worst of all in madness! Der Plan war bis jetzt gar nicht so unklar. Wir wollten durch die Türkei, die "-stans", Iran, Paksitan, Indien etc. weiter bis Thailand. Dort gibt es aber einige Hürden zu überwinden und wir wissen noch nicht, ob wir dazu bereit sind. Klimatisch müssten wir nach jetzigem Informationsstand spätestens bis Ende September mit dem Pamir Highway in Pakistan und der Strecke von Leh-nach Manali in Indien durch sein. Ist das überhaupt zu machen? Dem Ganzen steht natürlich auch noch China im Weg. Ein Guide kostet wohl Minimum € 80,00 p.Tag, hinzu kommen Versicherungen, ein chinesisches Kennzeichen und ein Führerschein. Alles ganz schön aufwendig und teuer. Mist! Mit dem Flugzeug von Duschanbe (Tadschikistan) oder Almaty (Kasachstan) nach Islamabad ist ja vlt. noch eine Möglichkeit. 1.1. Thailand - Guide-Pflicht - Warum? Neben China und Myanmar hat nun auch Thailand den motorisierten Touristen einen Guide verordnet. Die Regelung gilt ab März 2017. Kacke! € 6.000 oder mehr für Guides ausgeben. Das wollen und können wir nicht. Es ist wohl so, dass es in Thailand enorm viele Touristen aus China gibt. Diese Touris lassen ihre alten Autos einfach in Thailand stehen. Die Entsorgung kann somit der thailänsische Staat übernehmen. Das wollen die natürlich nicht. Von dieser Sicht kann man die Guide Pflicht verstehen. Für Motorradreisende, besonders "World Traveller", ist das indiskutabel. Wir wollen ja die Länder entdecken und nicht einem Auto oder Mopped hinterher tuckern. So ergeben sich bei uns mittlerweile alternative Gedanken, was die Routenplanung betrifft. Eine Alternative ist es die Tour im Bereich Asien zu verkürzen. Sprich: Wir erkunden einen kleinen Teil Indiens, vermtl. den Norden und schauen dann, wie wir die Moppeds nach Südamerika/Mittelamerika bekommen (mit einem Flug). Von wo das sein wird, wissen wir noch nicht. Alternativ könnten wir auch die CRF`s nach Hamburg senden und uns zwei Moppeds z.B. Costa Rica kaufen und sie am Ende der Reise dort auch wieder verkaufen. Möglich wäre hier einen Teil von Südamerika zu erkunden, durch Mittelamerika zu fahren, evtl. USA mit Kalifornien und Umgebung und vielleicht, wenn machbar Kuba. Ist das unsere Alternative?... Wir halten euch auf dem Laufenden. Und wie schnell die ganze Motorradfahrerei vorbei sein kann durfte ich auch erfahren. Ich hatte schon seit geraumer Zeit leichte Schmerzen in der Schulter, die sich im November 2016 verstärkten. Nach endloser Terminwarterei wurde eine Diagnose gestellt und ein OP Termin vereinbart. Am 24. Januar wurde dann eine athroskopische OP mit Entfernung vom Schleimbeutel und Abtrag von Knochen durchgeführt. Das ganze heisst "Impingement Syndrom". Klingt unspektakulär ist aber nach 5 Wochen immer noch nicht ok. Eher schmerzhaft. Saisonstart verschoben. Wer Infos zu dieser Schultergeschichte braucht kann mich gerne anschreiben. ***Mittlerweile haben wir die Touratech Stiefel im Laden anprobiert. Alleine kommt man nicht mehr heraus (das soll sich aber legen) und uns sind sie ein wenig zu globig und zu schwer. Also nichts für uns. The plan was not yet clear. We wanted to travel through Turkey, the "-stans", Iran, Paksitan etc. to Thailand. But there are some hurdles to overcome and we do not know yet whether we are ready for it. According to current information, we would have to be through the Pamir Highway in Pakistan and the route from Leh to Manali in India at the latest by the end of September, if we would like to ride in clima friendly times. We are not sure if this is possible. Another big problem is the way through China. You need a guide there wichde will probably cost a minimum of € 80,00 per day, plus insurance, a Chinese license plate and a driver's license. Everything quite expensive. Crap! In addition to China and Myanmar, Thailand has now also prescribed a guide for motorized tourists. The regulation is valid from March 2017. Such a crap! So if this continues we would have to spend on our route already € 6,000 or more for guides. We can not and we will not. It is probably the case that there are a lot of tourists from China in Thailand. This tourists simply leave their old cars in Thailand. The disposal can thus be carried out by the Thai state. They do not want that, of course. From this point of view you can understand the need for guides. For motorcyclists, especially "World Travellers", this is unacceptable. We want to discover the countries and not chug a car or motorcycle afterwards. I will definitely contact the embassy to see if there is something else possible. In this way we have alternative thoughts about route planning. An alternative is to shorten the tour in the area of Asia. Say: We are exploring a small part of India, The north and then look at how we get the motorcycles to South America / Central America (with a flight). 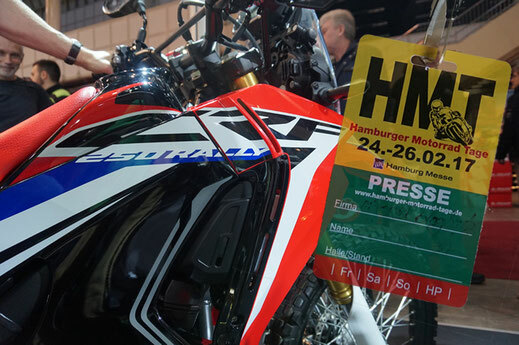 Alternatively, we could also send the CRF's to Hamburg and buy two motorcycles in e.g. Costa Rica and sell them at the end of the trip. It would be possible to explore a part of South America, to drive through Central America, possibly USA with California and the surrounding area and as a coronation, if feasible, Cuba. Maybe this is an alternative ... We keep you up to date. We also strolled over the HMT - the Hamburg motorcycle days. Although we are not the biggest Touratech we really liked the Touratech Adventuro helmet (too expensive for us) and the Touratech boots Destino (with inner shoe, waterproof and with possibility of connection). I was also able to learn how fast the whole motorcycling can be over in the last few weeks. I had a slight pain in the shoulder for some time, which intensified in November 2016. After an endless delay, a diagnosis was made and a surgery appointment agreed. On the 24th of January, an athroscopic surgery with removal from the mucus sac and removal of bones was carried out. The whole thing is called "impingement syndrome". Sounds unspectacular but after 5 weeks still not ok. More painful. If you need information about this "shoulder thing", please contact me.